Former Indian captain Kapil Dev has questioned the appointment of Sachin Tendulkar as the vice-captain of the Indian team for the World Cup and felt that Sourav Ganguly would have been a better choice. They have virtually been a breed apart. Plucked out of obscurity and thrust into the highly competitive world of cricket, some of the players from Asian sub-continent have forced the world to sit and take note of their exploits. Sourav Ganguly today supported the inclusion of little-known sides in the World Cup, saying that the experience of playing against stronger teams would stand them in good stead. All eyes will be on the Irfan Pathan when he takes the field for West Zone against Central in the Deodhar Trophy inter-zonal tournament here tomorrow. Pathan, who features in the 15-member World Cup squad, is yet to prove his fitness to BCCI selectors before boarding the flight to the Caribbean later this month. Three selectors, including chief selector Dilip Vengsarkar, will keenly watch the youngster’s performance against Mohammed Kaif-led Central Zone. With the strength of Australia receding considerably, the forthcoming cricket World Cup is going to a closely fought one, said Pakistan captain Inzamam-ul-Haq. “Any of the top five or six teams can win this World Cup. I think it will be one of the most evenly and closely-contested World Cup ever,” Inzamam told a press conference in Lahore today. The Punjab Cricket Association (PCA) Stadium, Mohali, which is considered to be among the best in the world, is on way to become even better. It was Rakesh Jolly’s day. This former Haryana Ranji Trophy medium pacer made his mark on the Chandigarh Golf Club greens today when he clinched the North Zone Civil Services Golf title returning a six over card of 69. Amid depiction of the rich cultures of the two Bengals through folk songs and dances, the Indo-Bangla Games was today inaugurated at the Salt Lake stadium here. Local giants East Bengal and Dempo Sports Club, Goa, finished goal-less to retain their positions at the top of the table in the 11th National Football League at Barasat today. Sandeep Garnaik and Satwinder Kaur were declared the best athletes in the men’s and women’s sections, respectively, in the 62th annual athletic meet of Government Bikram College that concluded here yesterday. “Sachin has never shown any interest in becoming the captain of the team once again. So why has he been made the vice-captain?” Kapil questioned. Kapil, under whose captaincy India lifted the World Cup in England in 1983, said “it would be an insult to Sachin if the selectors made him the vice-captain and then decided to make someone else the captain in future”. Incidentally, Kapil was the coach of the Indian team when Sachin made this declaration. “Sachin has never said anything publicly about his desire of becoming the captain again. If he wants to take up the job, he should say it openly, and not merely talk only to the selectors”, Kapil noted. Kapil also questioned Greg Chappell’s commitment to the team saying, “How is the World Cup important to Chappell? It doesn’t make any difference to him whether the Indian team loses or wins. It will only affect Indian cricket”. Kapil also downplayed his so-called differences with another former captain Sunil Gavaskar. “There could have been a difference of opinion on certain issues but both of us worked for the betterment of the team. When it came to the team’s interest, we gave our best”, added the former captain. Anil Kumble has said that the World Cup would probably be his last one-day tournament and that would be an added incentive for him to do well at cricket’s showpiece event in the Caribbean from March 13. “It will probably be the last one-day series for me and it will be challenging. I hope I will be able to play a much bigger role this time,” Kumble said. The 36-year old Bangalorean has played in 17 World Cup matches with 28 wickets to his name so far. He is also India’s leading wicket-taker in both forms of the game, with 334 scalps in ODIS and 547 in Tests. Kumble was irked by questions about his current form. “It is unfair to judge performance spread over three matches on good batting surfaces. You cannot always get three-four wickets per match. The main purpose is to restrict runs. I have the experience and hence am not worried,” Kumble told CNN-IBN. They have virtually been a breed apart. Plucked out of obscurity and thrust into the highly competitive world of cricket, some of the players from Asian sub-continent have forced the world to sit and take note of their exploits. Cricketing world, in fact, has always marvelled at the natural talent the Asian players are blessed with and their heroics even when they are raw. Remember how legendary Imran Khan spotted the peerless Wasim Akram and made him play for the country, which produced stunning results? Similar has been the story of Inzamam-ul-Haq or Sachin Tendulkar. This is in sharp contrast to the policy of countries like England, Australia, South Africa or even the West Indies, where players have to go through the grind of domestic cricket for a number of years, show results on a consistence basis and mature in years before they are considered for selection to the national squad. Inzamam-ul Haq chose the 1992 World Cup to showcase his raw talent. And he did it with a bang. A rookie Inzamam launched a stunning assault on the Kiwis in 1992 World Cup semifinal, paving the way for an unexpected victory for Pakistan. Wasim Akram’s magic with the ball in the final gave Pakistan their maiden World Cup. Even after 15 years, Pakistan is pinning hopes on Inzamam, his deputy Younis Khan and Mohammad Yousuf to win glory for their country for a second time. Sanath Jayasuriya has proved to be a trendsetter. 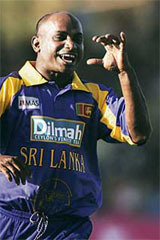 It was the man of the tournament Jayasuriya, who invented pinch-hitting during the 1996 World Cup and took the success he achieved to dizzy heights. His ability to clear the in-field with his ferocious cuts and pulls in the initial 15 overs along with diminutive Romesh Kaluwitharana changed the dynamics of batting in one-dayers for ever. Bowlers ran for cover. Manoj Prabhakar was a prominent casualty. Other teams tried to replicate the method, but with limited success. At 37, the “Butcher of Matara”, even after 11 years, is still going strong. In the twilight in his illustrious career, Jayasuriya has regained his lost touch and would be keen to do an Aravinda de Silva before bowing out. He has a touch of arrogance when on the crease. It reflects in his batting style as Shahid Afridi, on his day, is a nightmare for a bowler. The sheer magic of his power, timing, disdain towards the bowlers and belief on his abilities make Afridi dangerous and a vital cog in Pakistan’s one-day squad. Though he has let his team down on numerous occasions by his impetuosity, the Pathan has also won so many games single-handed. It is tough to keep the irrepressible Afridi out in one-dayers. His fastish leg-breaks are tough even for a well-set batsman. He has the knack of taking wickets when other bowlers are struggling. Surprisingly, even from a short run-up, Afridi occasionally flummoxes an unsuspecting batsman, unleashing a delivery as quick as a seamer occasionally bowls. The success achieved by the latest poster boy of Indian cricket, Mahendera Singh Dhoni is nothing less than a fairytale. Playing cricket for Jharkhand, Dhoni made it a habit to hit towering sixes. The hard-hitting wicketkeeper batsman holds the record of hitting maximum sixes (10) in a one-day match for India and is one six short of the record held jointly by Afridi and Jayasuriya. “It is the duty of stronger teams to support these teams to do better. If you do not play against these teams, they will not get exposure,” Ganguly told newspersons here. Ganguly did not agree that the presence of sides like Bermuda, Canada, Ireland, Scotland and the Netherlands would rob the World Cup of its lustre. “I don’t think so. We are playing these teams only in the preliminaries,” he replied. Ganguly said India, too, had gone through the same stages of development as these sides taking part in the upcoming World Cup. Ganguly also felt that the established sides would not be lacking in motivation when they square up against the minnows. “The event itself is enough to get motivated,” he said. All eyes will be on the Irfan Pathan when he takes the field for West Zone against Central in the Deodhar Trophy inter-zonal tournament here tomorrow. Pathan, who features in the 15-member World Cup squad, is yet to prove his fitness to BCCI selectors before boarding the flight to the Caribbean later this month. Three selectors, including chief selector Dilip Vengsarkar, will keenly watch the youngster’s performance against Mohammed Kaif-led Central Zone. The left-arm seamer, who was suffering from a sore shoulder, had already declared himself fit during promotional visits to Ahmedabad and Delhi. Pathan arrived well in advance at Motera last night and practiced in the nets along with his West Zone mates. Vengsarkar, who flew in from Mumbai last evening, watched Pathan bowl a few deliveries from close quarters here. “We are only here to see whether he (Pathan) is match-fit,” Vengsarkar told reporters at the Sardar Patel stadium last night. “He has played in just one of the last eight ODIs,” he said adding that Pathan was picked for just last match against West Indies and missed out on the entire four-match series against Sri Lanka due to a sore shoulder. “We have already got a report from team physio John Gloster stating that Pathan is 100 per cent fit,” Vengsarkar said about the young all-rounder, who is expected to lend a crucial balance to the Indian team during the World Cup. “Bowling in the nets and bowling in a match are two different things. We want to see how he responds to different pressures in a match,” Vengsarkar said. The former cricketer, however, expected Pathan to perform well in the opening day-and-night Deodhar match. With the strength of Australia receding considerably, the forthcoming cricket World Cup is going to a closely fought one, said Pakistan captain Inzamam-ul-Haq. “Any of the top five or six teams can win this World Cup. I think it will be one of the most evenly and closely-contested World Cup ever,” Inzamam told a press conference in Lahore today. He said though Australia’s recent defeats would have come as a morale-booster for some of the title contenders, one should not take the defending champions for granted. “I don’t think five defeats in a row means you can write off Australia. Five matches are nothing when you consider they have been winning for so long. But yes, their defeats mean that they don’t have that invincible aura about them any longer. And Brett Lee’s injury is also a setback for them,” Inzamam said. Australia recently were outclassed 3-0 in a one-day series in New Zealand and were earlier beaten by England in the tri-series final at home. Champions in the last two World Cups, Australia have lost six of their last seven matches. The 36-year old Pakistan skipper, who will be appearing in his fifth World Cup, said he remained hopeful about Pakistan’s chances despite their recent poor form. “Quality never dies and we have a lot of quality players. We have been wining matches in the past with this same combination. It is just a matter of everyone clicking together,” he said. Inzamam, Pakistan’s leading one-day scorer with 11,665 runs under his belt, said fitness problems of Shoaib Akhtar, Mohammad Asif and some other players were setbacks for the team. “But I am still positive that Shoaib and Asif will be fit for the tournament and will also clear their dope tests. So far, to be honest, we have not even thought about their replacements,” he added. Inzamam had no doubt that if Pakistan had all its leading bowlers available, it would have the most formidable attack in the tournament. “We will be the best in the tournament as far as our bowling is concerned. But let us see what happens in the next few days,” he said. Defending the selection of pacer Rana Naved, Inzamam said the seamer was drafted in because of his previous performances. “I think this is the time everyone should back him. He has performed well in the past and that is why I am backing him. He should not be written off like that. We must keep faith in our players who have not been performing well in recent matches,” he said. The PCA managing committee, headed by president I.S. Bindra, is learnt to have cleared the plans for the massive capacity addition as well as upgradation of current facilities. The project is likely to end before the end of this year. According to sources, the PCA intends to add at least 20,000 more seats for spectators, taking the total capacity to a whopping 65000-plus, making it one of the biggest in the country after the Eden Gardens, Kolkota. After 1993, the year it was built, this will be the first time such a major expansion will take place at the stadium, though some additions and alterations have taken place in the past. In September last year, just before the Champions Trophy matches that it hosted, a new block had been added while one of the pavilions had been extended to add to the number of spectators. “It has been decided to convert the present chair blocks into two-tier stands, which will, apart from adding to the capacity by at least 20,000 spectators, also provide a shield to the spectators from direct sunlight and rains. As for those seated on the first floor, we have decided to provide cover against direct sunlight and rains to them also,” a senior PCA official told The Tribune. The expansion also includes adding more rooms to the already existing rooms in the stadium for the stay of Ranji teams that play at the stadium. “We intend to have at least 28 rooms and suites,” the official said. The media box is also planned to the shifted from its present location to the City-End pavilion. Separate new boxes are also on the anvil for the judges of the Punjab and Haryana High Court and ministers. Jolly wielded the golf club in the same fashion as he executed the strokes with the bat to clinch the title. Finishing one stroke behind him was Rupinder Singh. S.K. Sharma returned a 10-plus card of 82 to clinch to finish third. Devinder Singh and J.S.Mahi tied for the fourth place with 83. But because of a better back nine J.S. Mahi occupied the spot. The net winner among the serving officers was Devinder Singh who carded 65. K.P.Singh finished one stroke behind to occupy the runner up spot. Punjab also clinched the team title to make it a double after S.K. Sharma’s victory. The team event went into an exciting finish with Punjab emerging the winner over Haryana because of a better back nine score. R.S. Chalia, who carded a gross score of 87, clinched the gross title among the retired civil services officers. The runner-up B.R. Banga also carded 87, but because of a better back nine Chalia was declared the winner. Former Haryana Ranji Trophy cricketer Rakesh Jolly was declared the best central service golfer with a card of 79. The following will represent north zone in the inter-zonals: Rakesh Jolly, Rupinder Singh, S.K. Sharma, Devinder Singh, J.S. Mahi, K.P. Singh, A.P. Panday, G.S. Hira, Hardeep Kumar, R.P. Chander, Vikas, R.K. Arora, R.S. Sandhu and B.K. Sandhu. Results: Serving officers: gross — Rakesh Jolly (79), Rupinder Singh (80), S.K.Sharma (82), J.S. Mahi (83); net — Devinder Singh 65, K.P. Singh 66. Retired officers: gross — R.S. Chalia 87, B.R. Banga 87; net — Sultan Singh 72, Ashwini Luthra 74. Team championship: Punjab 1, Haryana 2. Best State Civil Services Golfer: Rupinder Singh (80). Best Central Services Golfer: Rakesh Jolly (79). Best All-India Services Golfer: S.K.Sharma (82). Longest drive: D.S.Garcha (280 yards). Nearest to pin: R.K.Arora (10 ft 3 in). Inaugurating the games, Information and Broadcasting Minister Priya Ranjan Dasmunshi stressed the need for fostering friendship and amity between the Bengali-speaking people in India and Bangladesh. “I was born in what is called Bangladesh now. So, I have a special affection for the people of Bangladesh,” he said. Indian Olympic Association chief Suresh Kalmadi, Olympic Council of Asia General Secretary Randhir Singh and West Bengal Sports Minister Subhas Chakraborty were among those present at the inaugural ceremony that saw schoolchildren presenting songs and dances. Famed singers from West Bengal and Bangladesh enthralled the couple of thousand spectators at the stadium. Meanwhile, Kalmadi said the IOA was striving to get chess included in the Olympics. “The world chess governing body FIDE is in touch with the International Olympic Committee (IOC) on the matter. At the same time, the All-India Chess Federation is also writing to the Olympic Council of Asia on this,” Kalmadi said. Referring to the 2010 Commonwealth Games, to be hosted by New Delhi, Kalmadi said efforts were on to create a better focus for India in the Commonwealth countries. For this, a special fund would be made available by the Union ministry for Sports and Youth Welfare. Kalmadi said a special brochure on the games would be prepared next year and circulated among the MNCs for getting sponsorship. Turning to the Bangla Games, he said these would be held every year alternately in India and Bangladesh. “Next year, Bangladesh would stage the games. It was being planned on the lines of the Indo-Pak Punjab Games, which had their maiden edition at Patiala in 2004,” he added. After six matches, East Bengal, Dempo and Mahindra United have gleaned 11 points to remain ahead of the other teams in the high-profile league. Dempo were the better side on view in the Barasat Stadium encounter, though East Bengal also got a few chances. The Goans initially depended on sudden counter-attacks, but went all out after change of ends. Brazilian Ranty Martins was the fulcrum of Dempo’s moves. But East Bengal custodian Rajat Ghoshdastidar brought off some fine saves to prevent his side’s collapse. East Bengal had a good chance in the third minute when following a long throw-in from the right, Izumi Arata headed towards the goal and Ambani, who was following the ball, tried to nod home, but only managed to hit the bar. A little later, Dempo came close to scoring as East Bengal stopper M Suresh delayed a clearance and the dangerous Anthony Pereira charged him. However, Suresh finally managed to put the ball out for a corner. East Bengal’s strength was depleted as Alvito de Cunha left the ground with a calf injury, while Covan Lawrence went out following a handswing problem. The prizes were distributed by former chairman of Punjab School Education Board Mukhtiar Singh in the presence of the ADC (Development) Gurkirat Kirpal Singh, college principal Bhupinder Kaur and local sports personalities. Results: 800m (boys): Tanmeet Singh 1, Harmail Singh 2, Paras 3. High jump (girls): Satwinder Kaur 1, Harsimran Kaur 2, Mandeep Kaur 3. 100m (boys): Sandeep Singh 1, Tanmeet Singh 2, Gaurav Pal Singh 3. 100m (girls): Satwinder Kaur 1, Sumeet Kaur 2, Puja 3. High jump (boys): Mandeep Singh 1 , Vaneet Singh 2, Harmail Singh 3. 400m (boys): Sandeep Garnaik 1, Harmail Singh 2, Ramanpreet Singh 3.